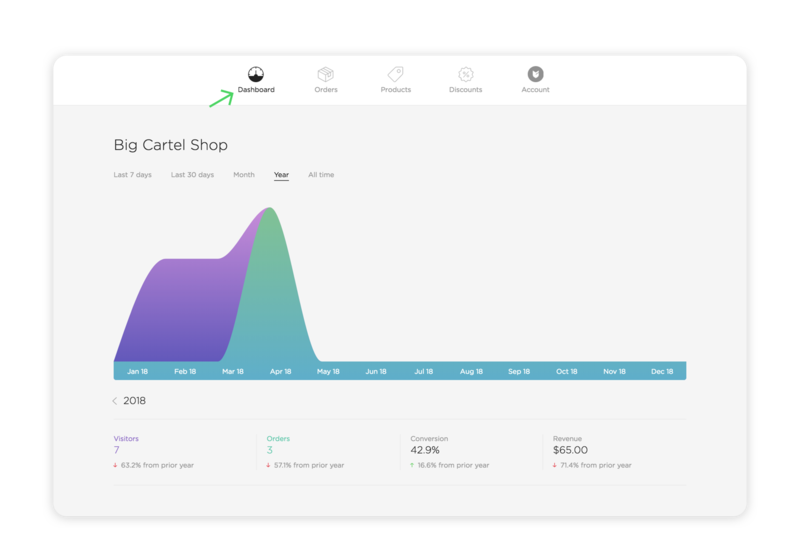 The Dashboard is where you’ll land when you log in to your store’s admin. This is where you can see up-to-date sales and visitor stats for your shop. Here you can view all kinds of data to help you understand how your shop is doing. How many people are visiting but not buying, for example? What’s your most popular product? Did that email blast pay off with a spike in sales? Now you’ll know. 📊 So, what’s the graph all about? The blue-green areas on the graph represent orders placed in your shop, and the purple shows visits. You can see hard numbers for both visitors and orders on the right-hand side of the graph as well. Both unique and repeat visits are counted. Heads up! Visitors aren’t tracked while your shop is in maintenance mode. We don’t want to skew your conversion rate. 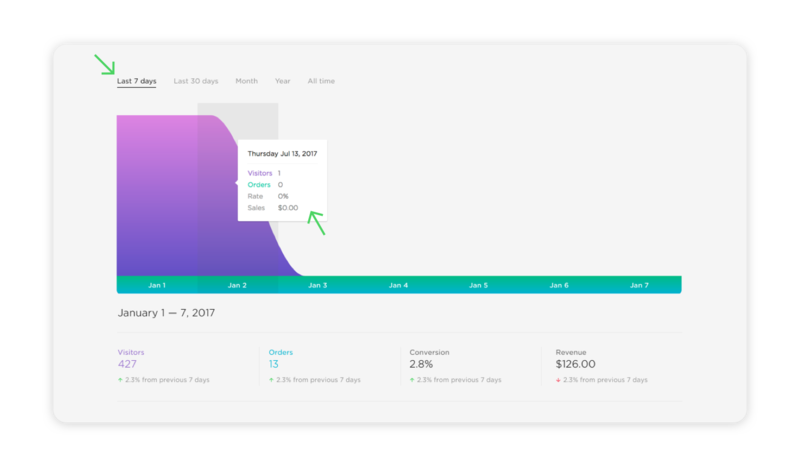 Hover over areas of the graph to view a breakdown of visitors, orders, conversion rate, and revenue for that time period. Adjust the timeframe below the graph to take a shorter or longer view of your stats. Data magic! To sort stats based on time period, tap the range options at the top. Below the graph, tap the Daily or Monthly header to display the relevant stats, or tap Totals to see the total stats for the selected time period. Tap the graph to view the breakdown of stats based on the chosen time.